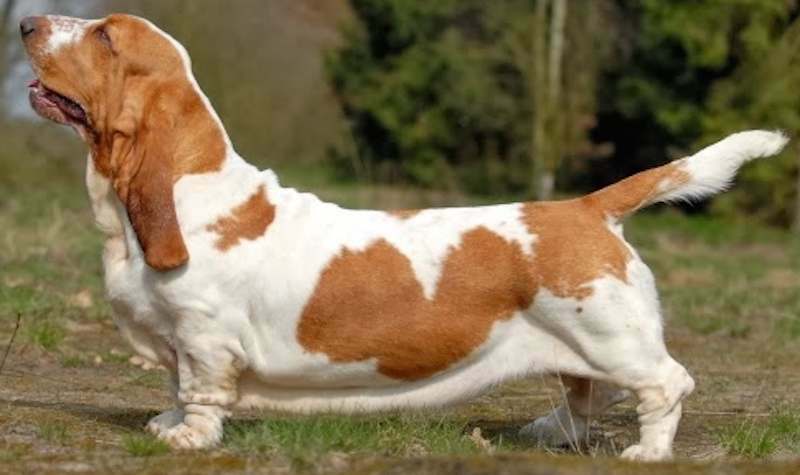 Basset Hound comes from France where its name means “low set” – a perfect description for this short-legged dog that appears to be ‘all ears.’ Historians believe he may have descended from the now-extinct St. Hubert Hound. 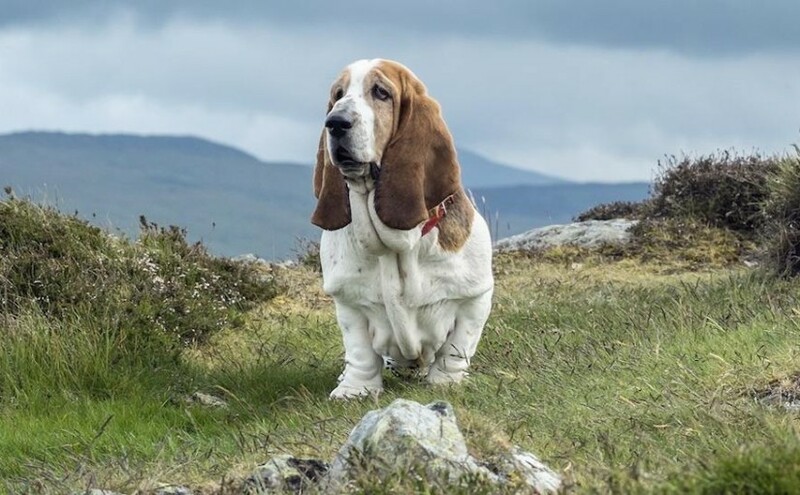 Sportsmen work the breed in packs to trail hare and deer where the Basset’s low, sturdy frame is well suited for moving through dense cover. 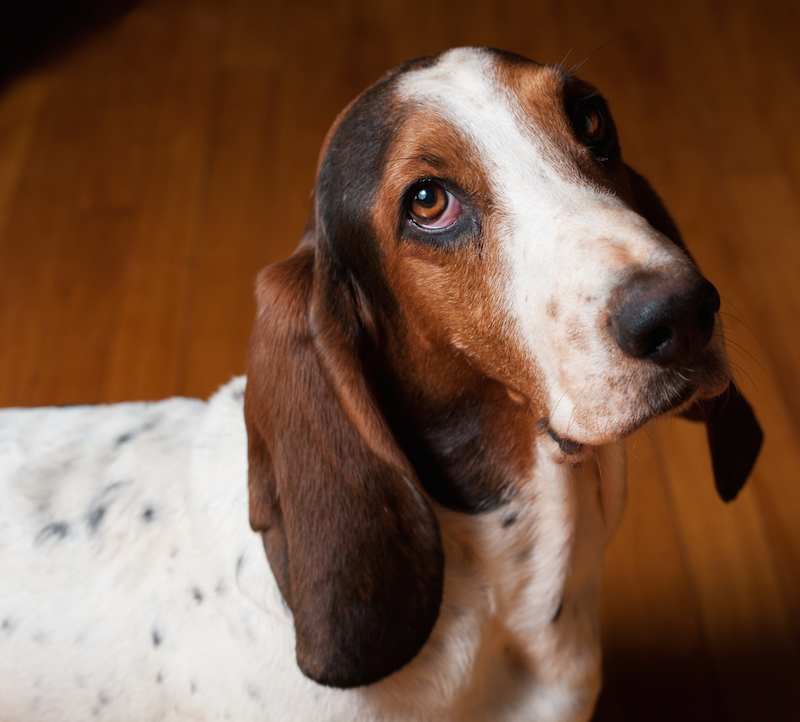 It is believed that George Washington once owned a pair of Bassets presented to him by the Marquis de Lafayette. 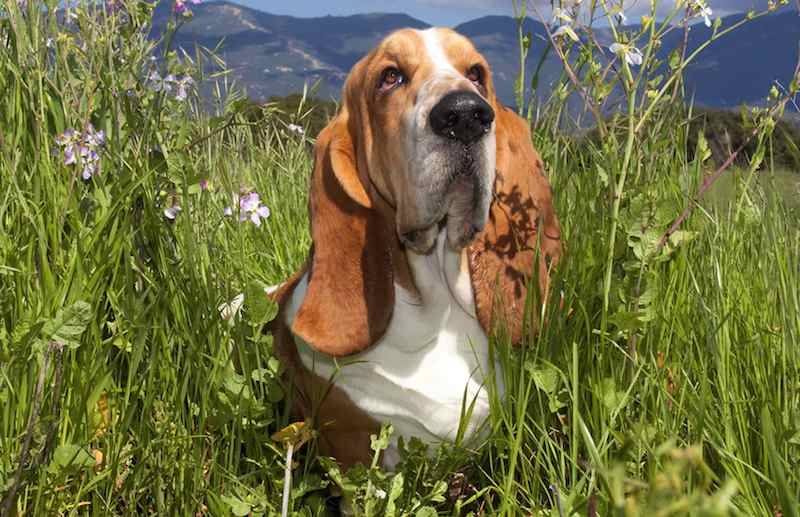 Basset Hound Temperament: Mild in temperament, the Basset is a dependable friend and companion. Don’t let the mournful expression and the languorous appearance fool you. Like any good hound, it only takes a whiff of an interesting scent to get him off and running. He’s capable of great endurance and can cover a great deal of distance in a short time. Though he adapts well to either city or country living, he requires a daily walk or the equivalent exercise. Coat and Colour: The coat should be similar to that of the Foxhound, not too fine and not too coarse, but yet of sufficient strength to be of use in bad weather. The skin loose and elastic. No good hound is a bad colour, so that any recognized Fox-hound colour should be acceptable. Head: The head should be large. The skull narrow and of good length, the peak being very fully developed, a very characteristic point of the head, which should be free from any appearance of, or inclination to, cheek bumps. It is most perfect when it closest resembles the head of a Bloodhound, with heavy flews and forehead wrinkled to the eyes. The expression when sitting or when still should be very sad, full of reposeful dignity. The whole of the head should be covered with loose skin, so loose in fact, that when the hound brings its nose to the ground the skin over the head and cheeks should fall forward and wrinkle perceptibly. The nose itself should be strong and free from snipiness. While the teeth of the upper and lower jaws should meet, a pig-jawed hound, or one that is underhung, is distinctly objectionable. The eyes should be deeply sunken, showing a prominent haw, and in colour they should be a deep brown. The ears are very long, and when drawn forward, folding well over the nose. They are set on the head as low as is possible and hang loose in folds like drapery, the ends curling inward, in texture thin and velvety. Neck: The neck is powerful, with heavy pendant dewlaps. Forequarters: The shoulders are muscular, sloping and well laid back. The forelegs should be short, very powerful, very heavy in bone, close fitting to the chest with a crooked knee and wrinkled ankle, ending in a massive paw. A hound must not be “out at elbows.” He must stand perfectly sound and true on his feet, which should be thick and massive, and the weight of the forepart of the body should be borne equally by each toe of the forefeet so far as it is compatible with the crook of the legs. Body: The chest should be deep and full. The body should be long and low and well ribbed up. Hindquarters: The quarters should be full of muscle, which stands out so that when one looks at the dog from behind, it gives him a round, barrel-like effect, with quarters “round as an apple.” He should be what is known as “a good dog to follow,” and when trotting away from you, his hocks should bend well and he should move true all round. A hound should not be straight on his hocks, nor should he measure more over his quarters than he does at his shoulder. Tail: The stern is coarse underneath, and carried “gaily” in hound fashion. Faults: “Out at elbows” is a bad fault. Slackness of loin, flat-sidedness and a roach or razor back are all bad faults. Cow-hocks, straight hocks, or weak hocks are all bad faults. Disqualifications: Unsoundness in legs or feet should absolutely disqualify a hound from taking a prize. 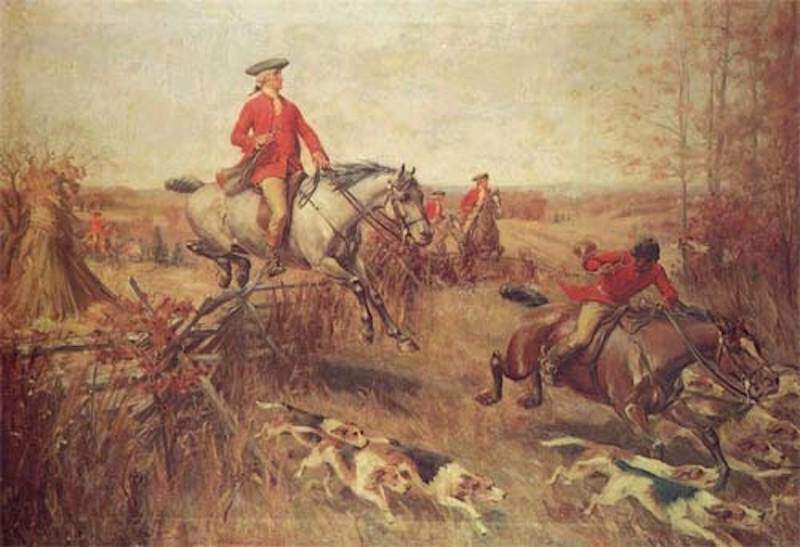 Photo: George Washington was a dog enthusiast and passionate about fox hunting. He kept over 36 hounds including basset hounds and had some favorites who went everywhere with him. Washington also helped bring into existence the American Foxhound. Link: Basset Hound video on Animal Planet.